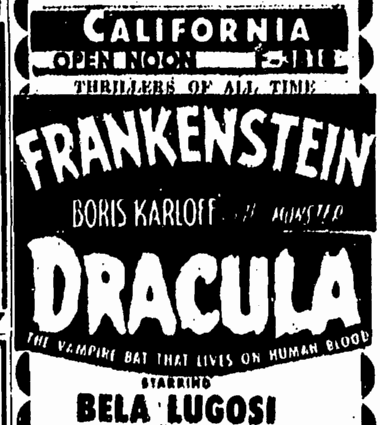 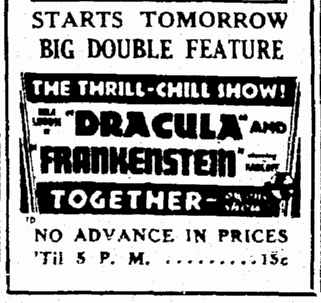 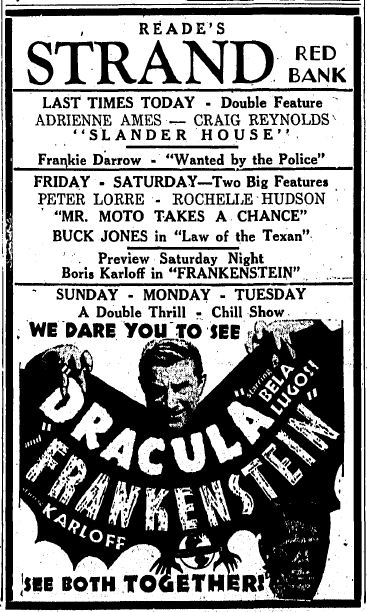 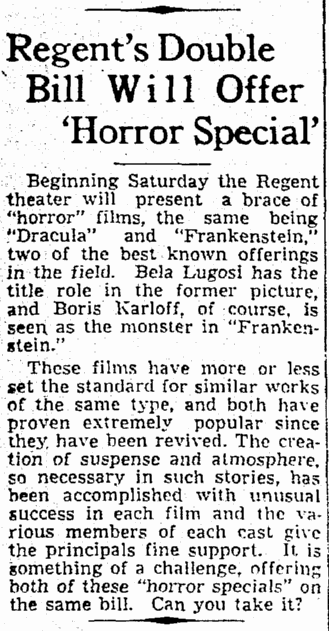 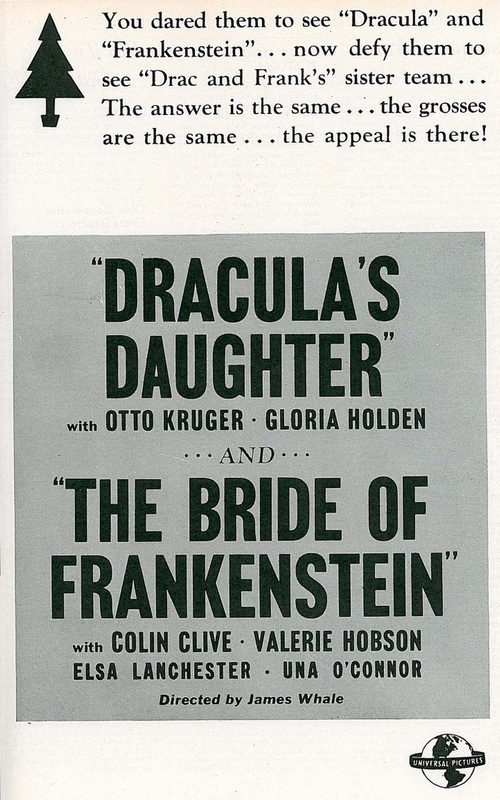 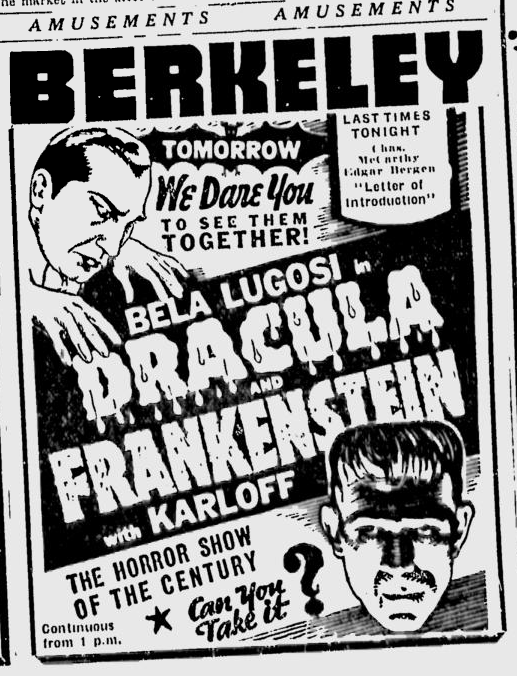 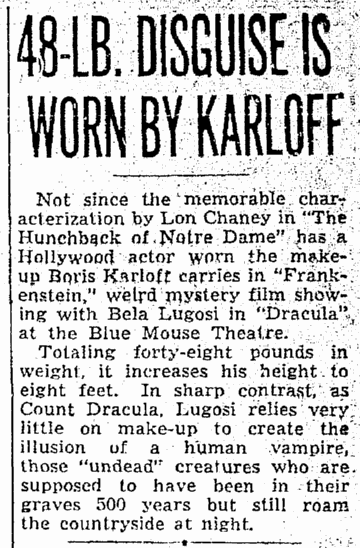 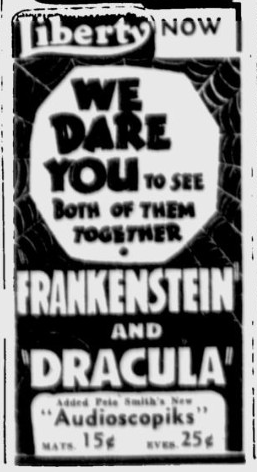 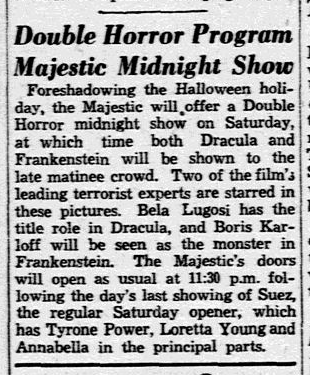 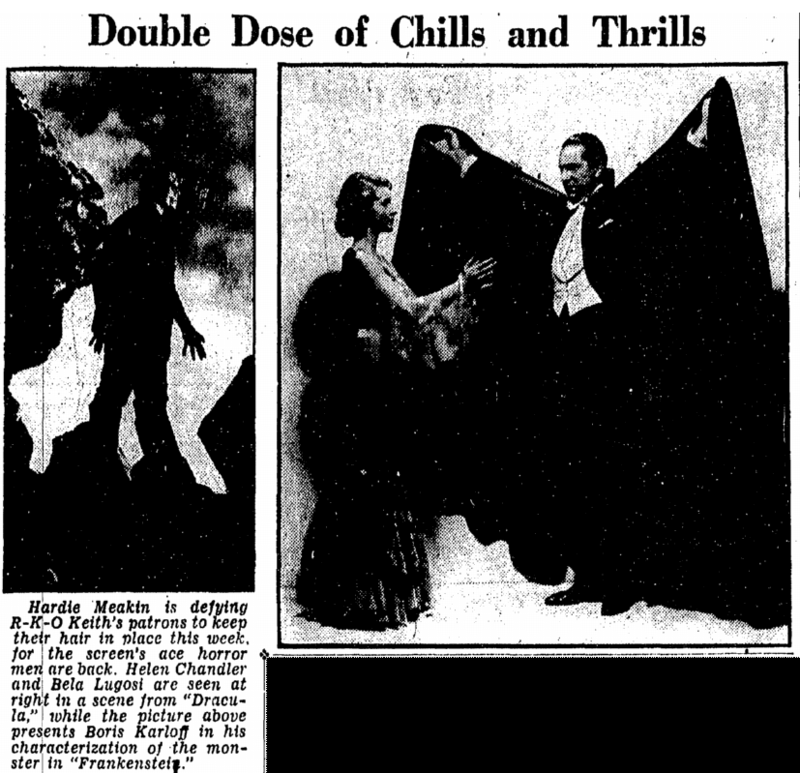 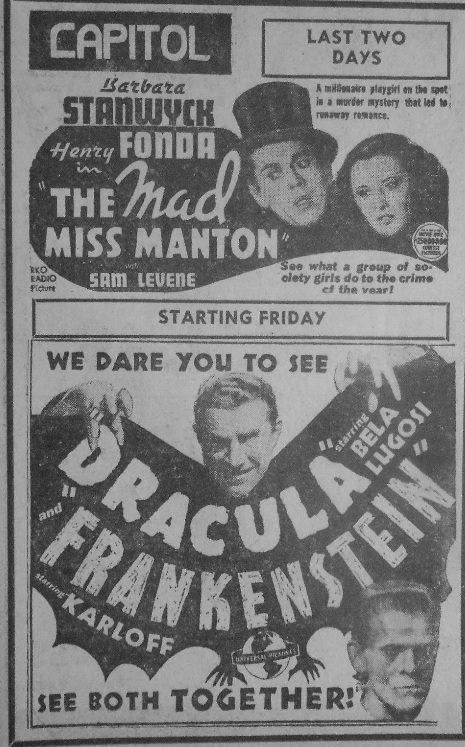 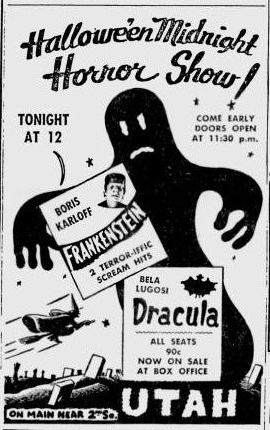 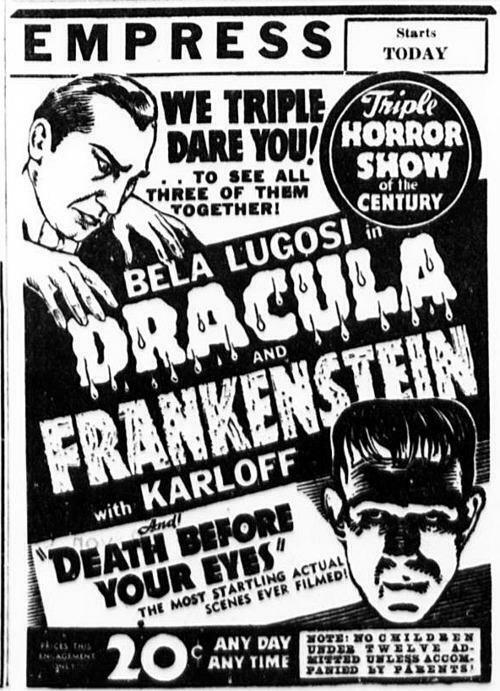 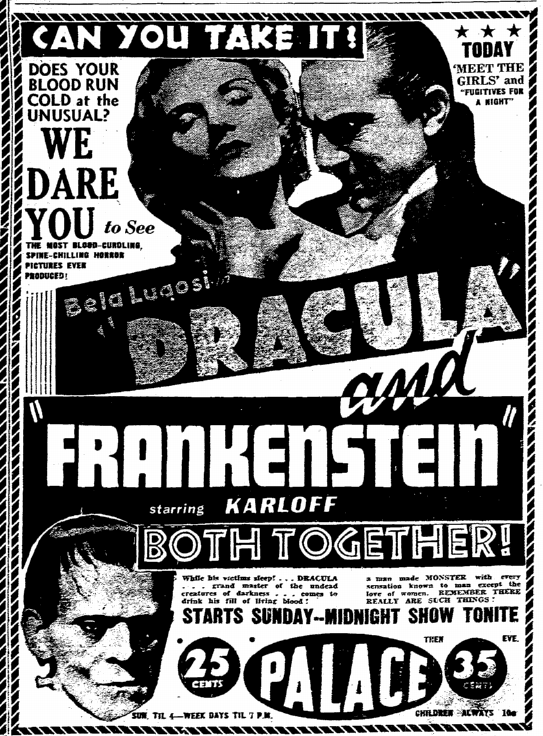 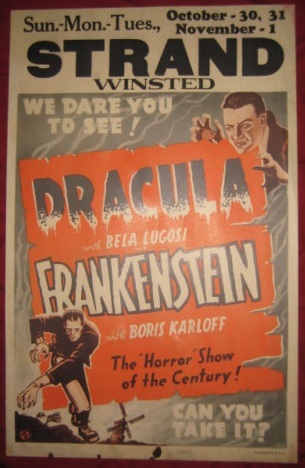 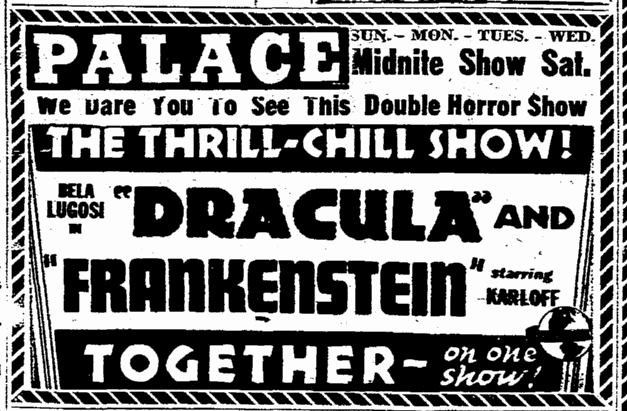 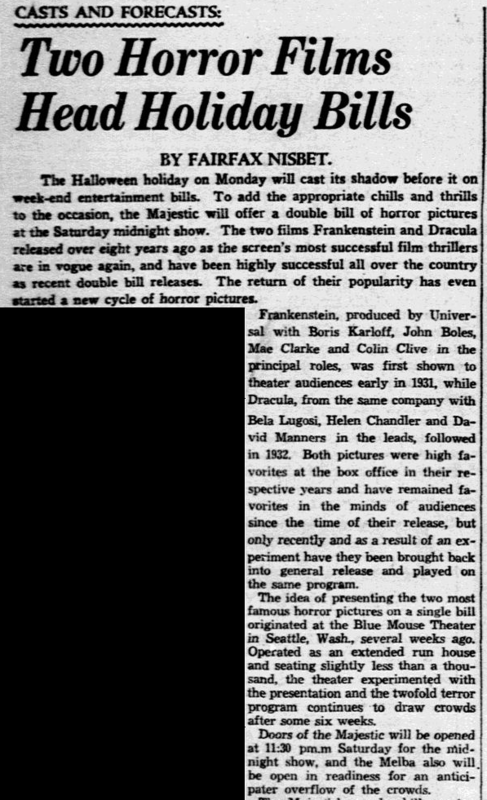 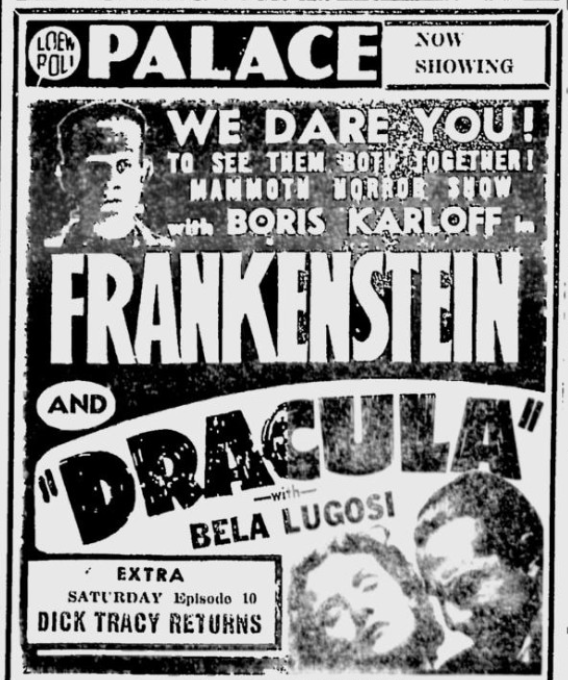 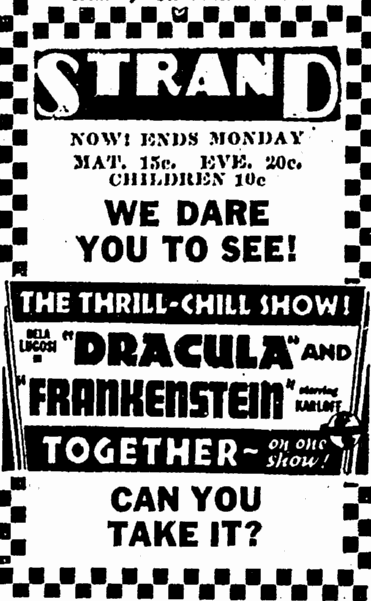 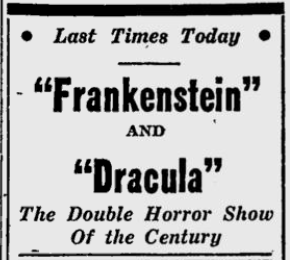 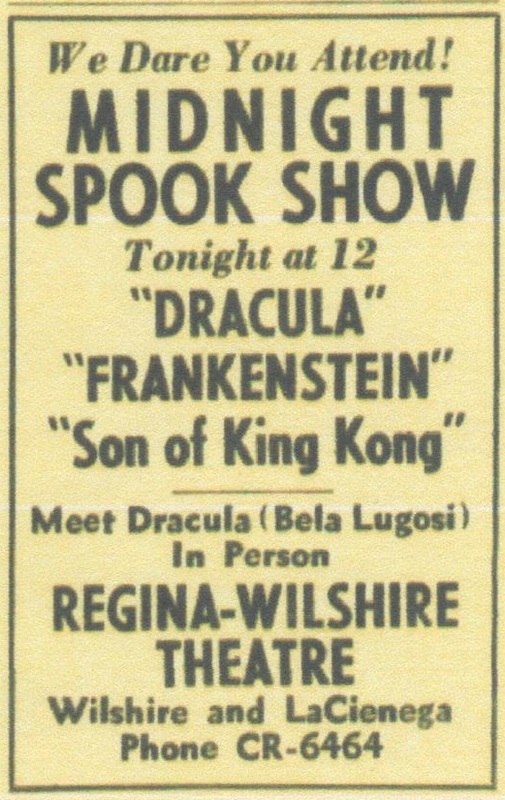 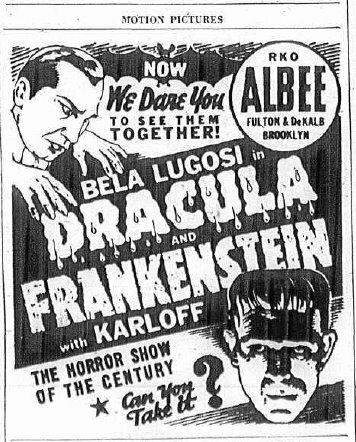 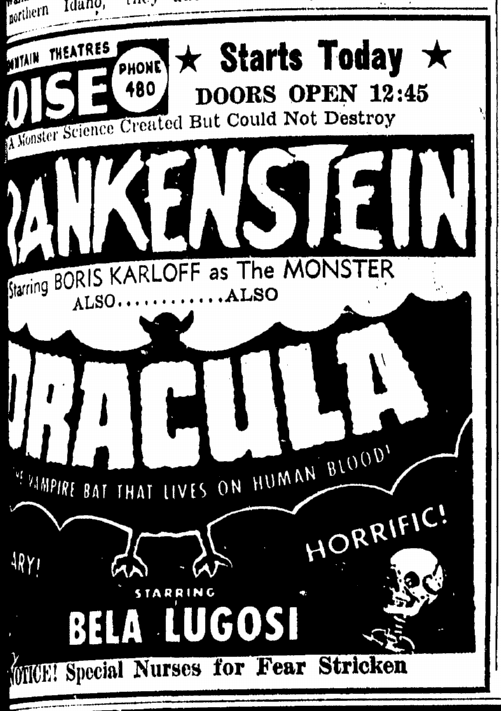 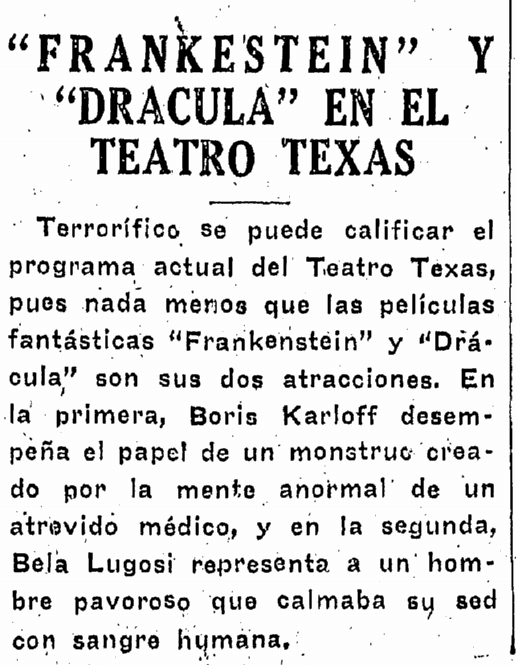 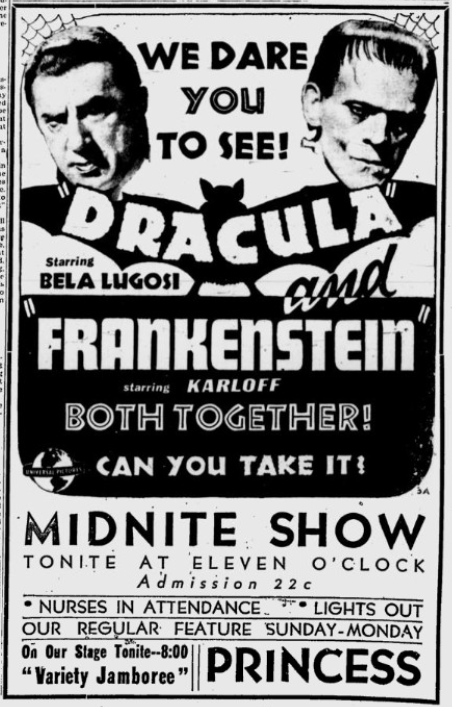 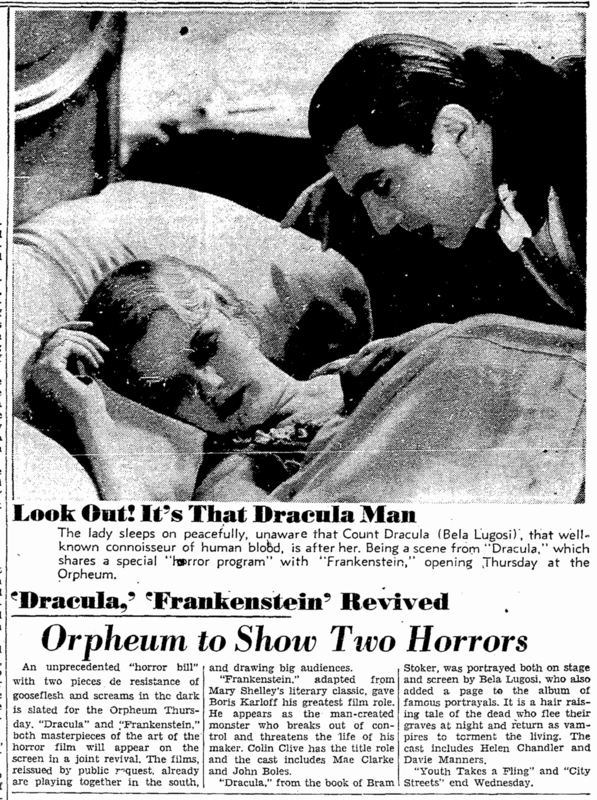 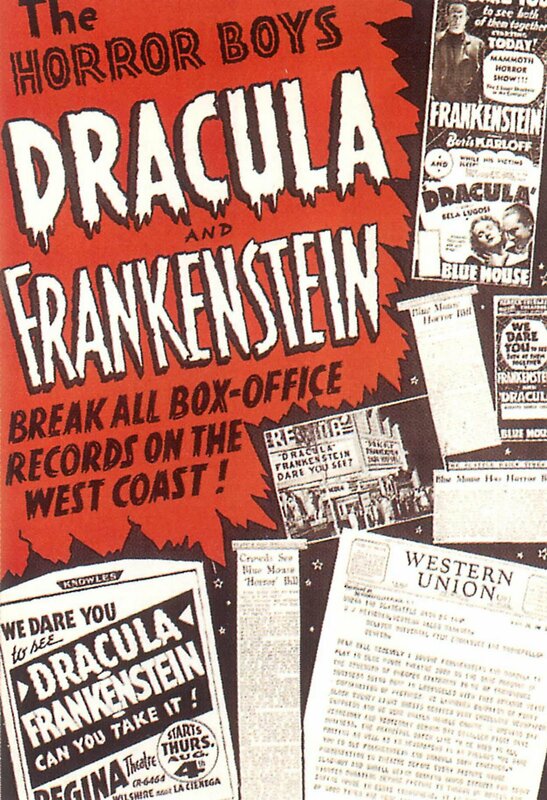 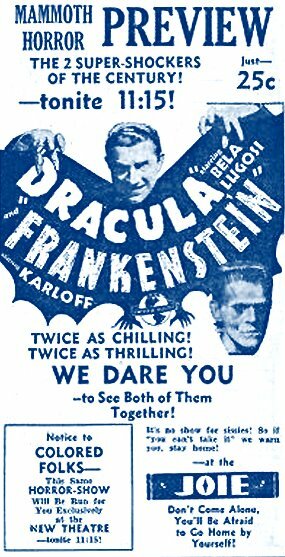 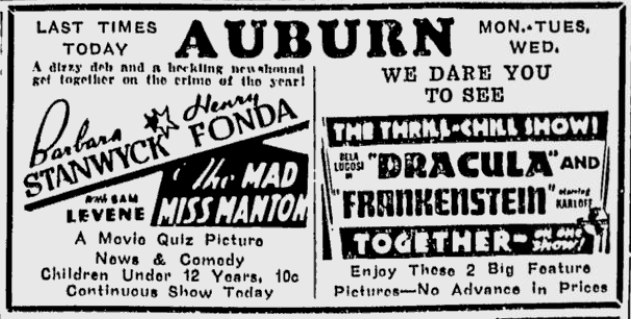 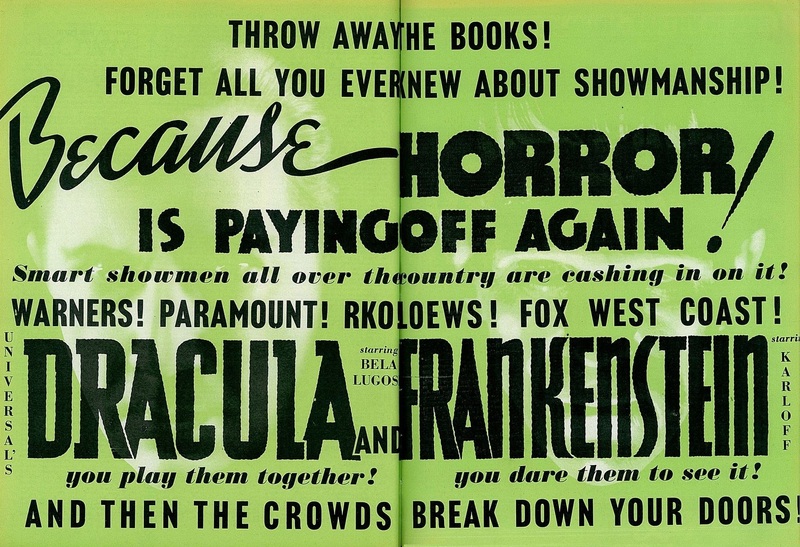 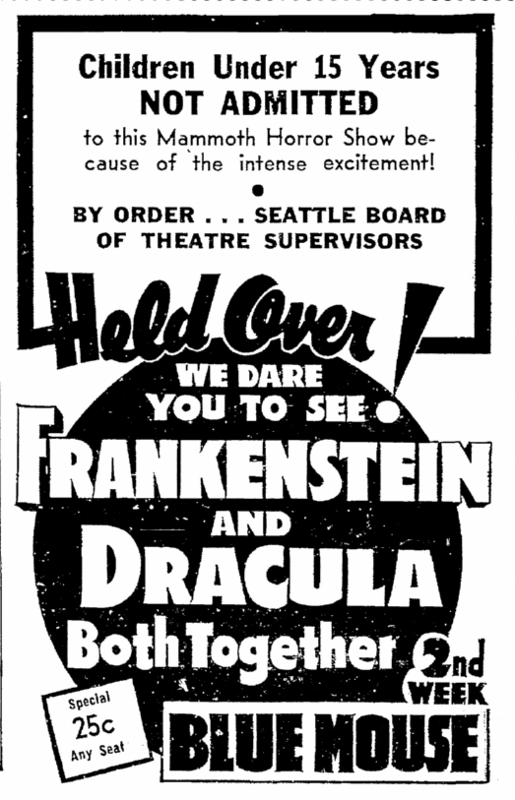 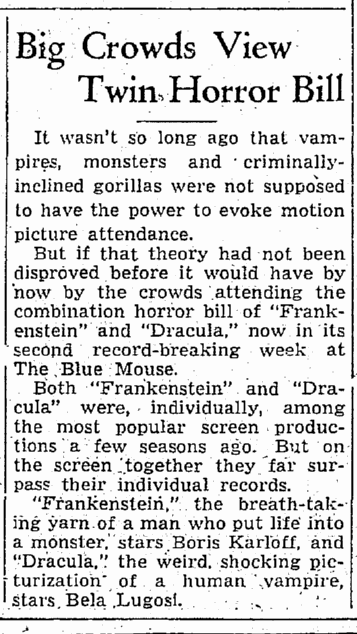 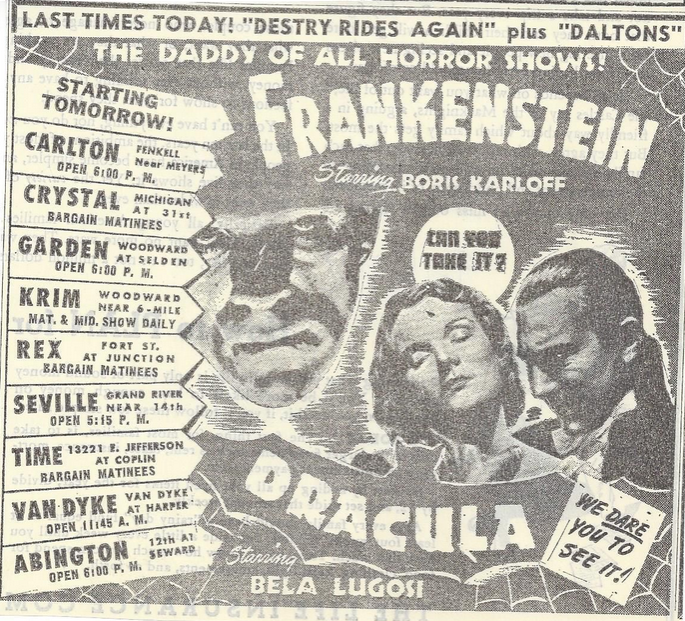 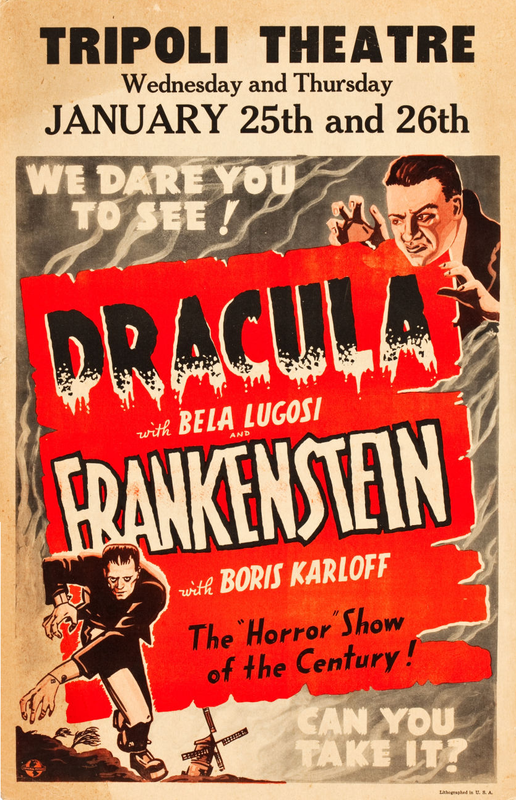 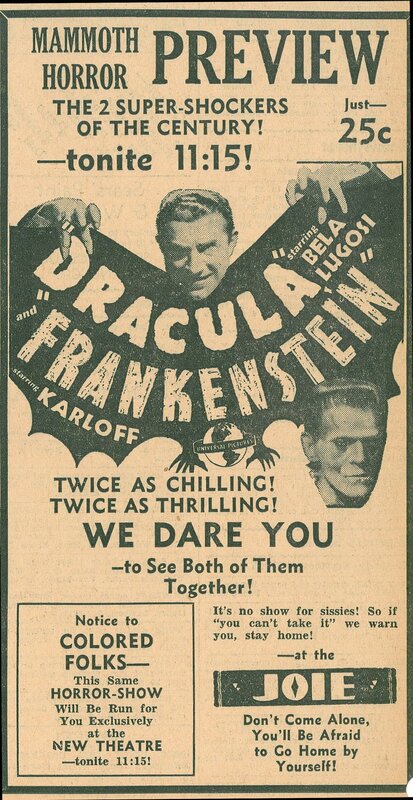 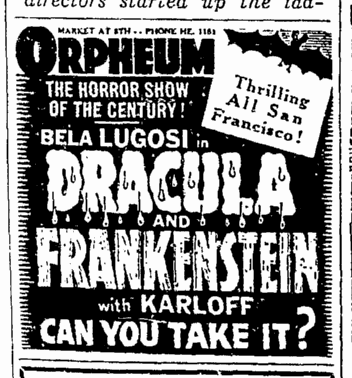 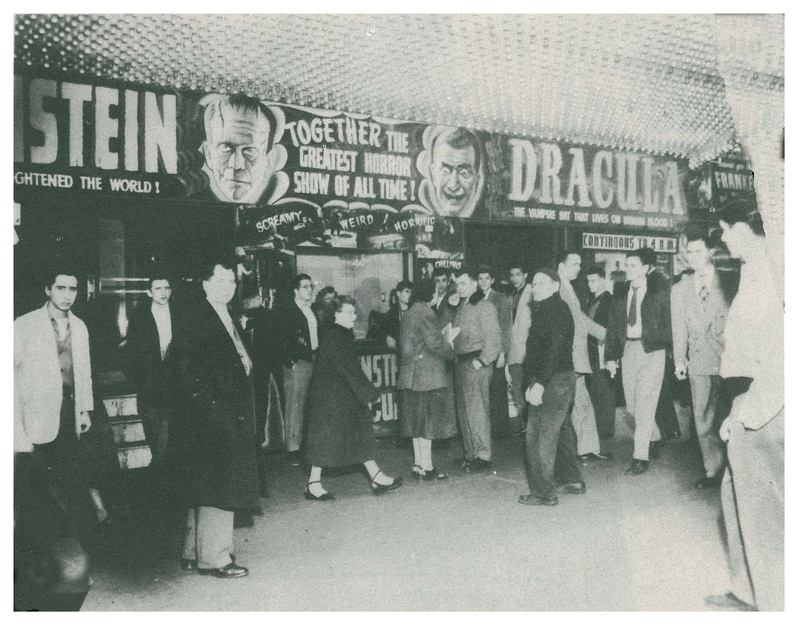 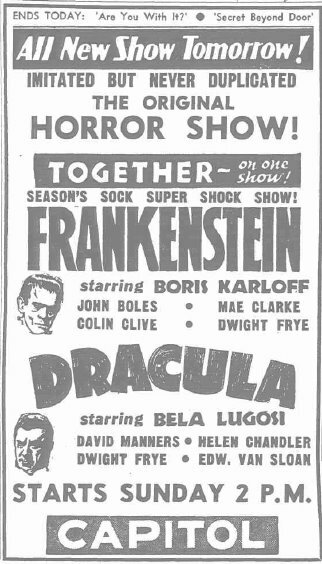 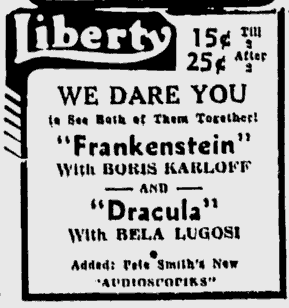 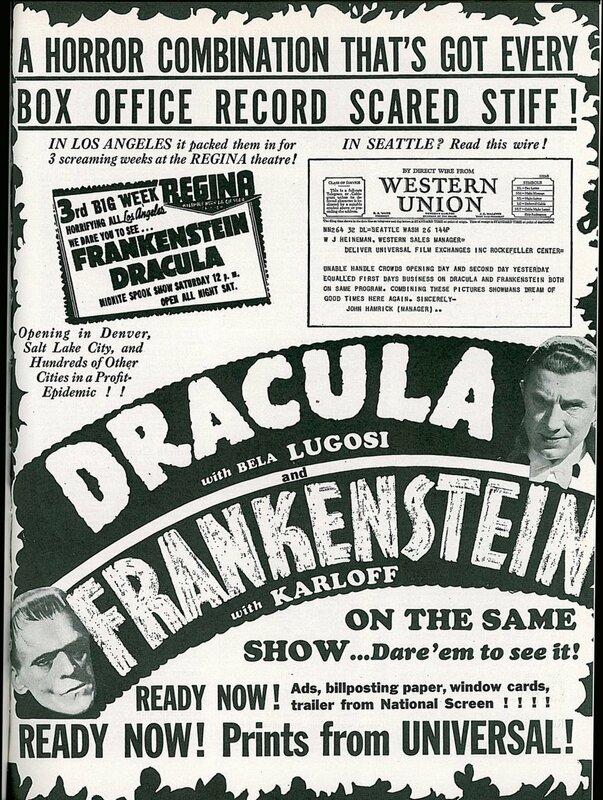 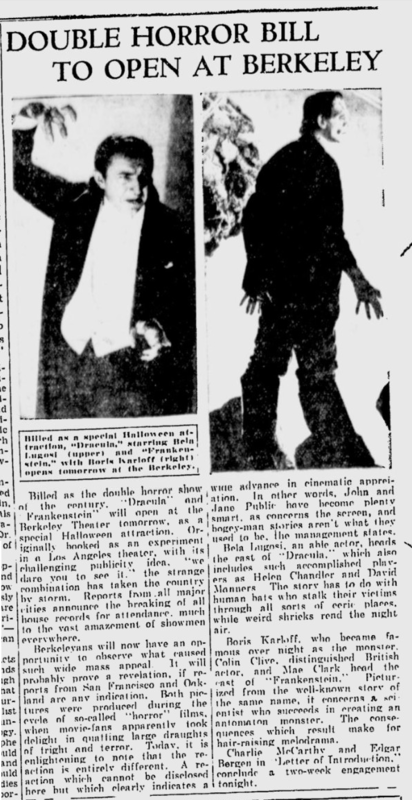 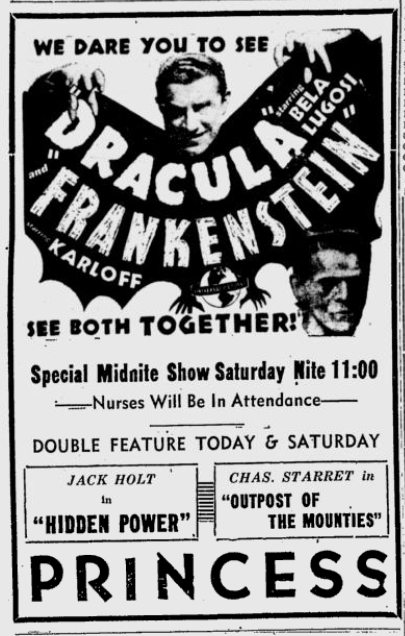 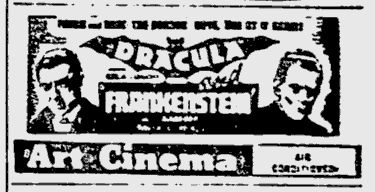 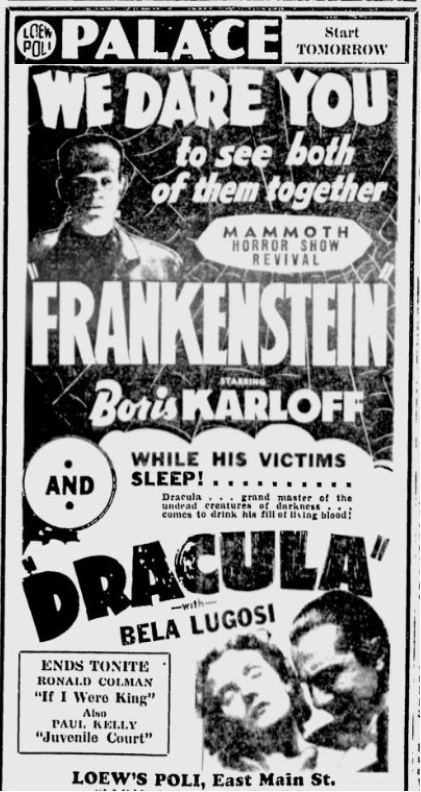 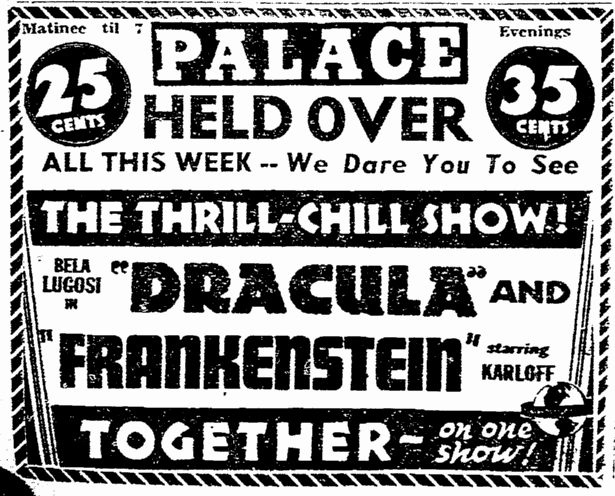 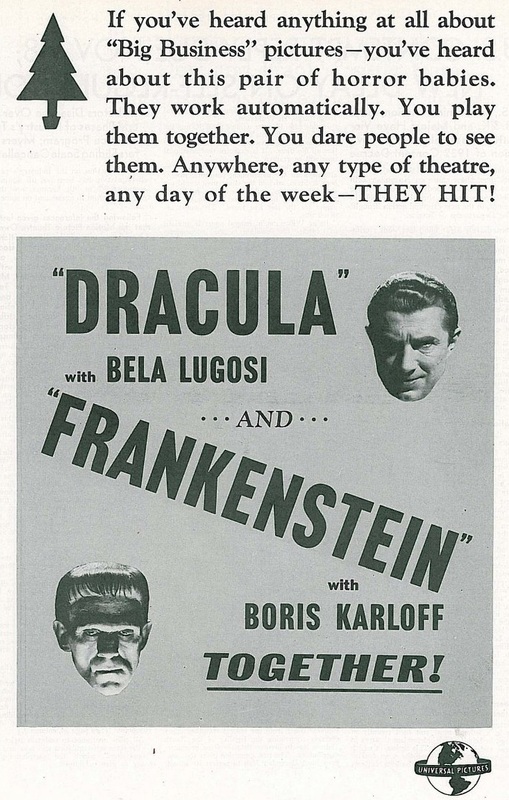 On Thursday, August 5, 1938, the Regina-Wilshire Theatre at Wilshire and La Cienega in Los Angeles, trying to stave off bankruptcy, began what was intended as a four-day run of a tripple-bill feature of Dracula, Frankenstein and Son of King Kong. 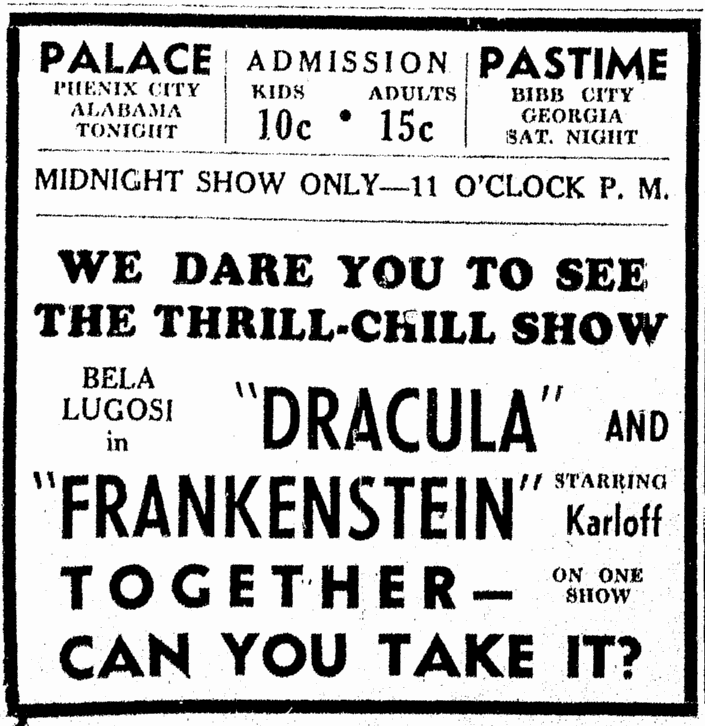 The bill unexpectedly captured the public’s imagination and became an overnight sensation. 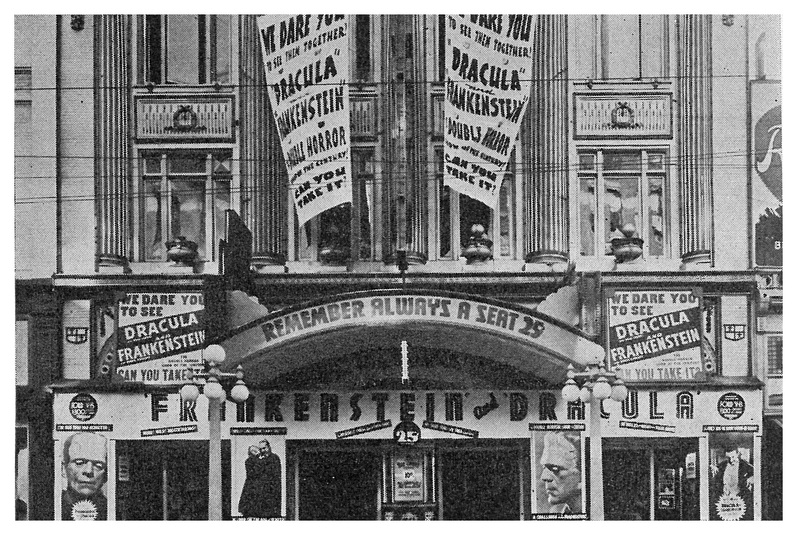 It was soon playing 21 hours a day to packed houses while police controlled the crowds queuing around the block. 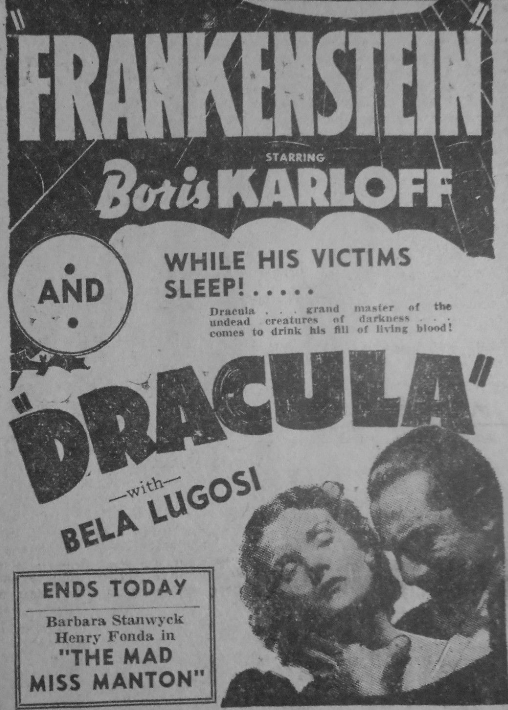 At the same time, an unemployed Bela Lugosi, who, apart from one week’s work in the Republic serial S.O.S Coastguard in 1937, had not been offered film work for two years, was suffering dire financial problems. 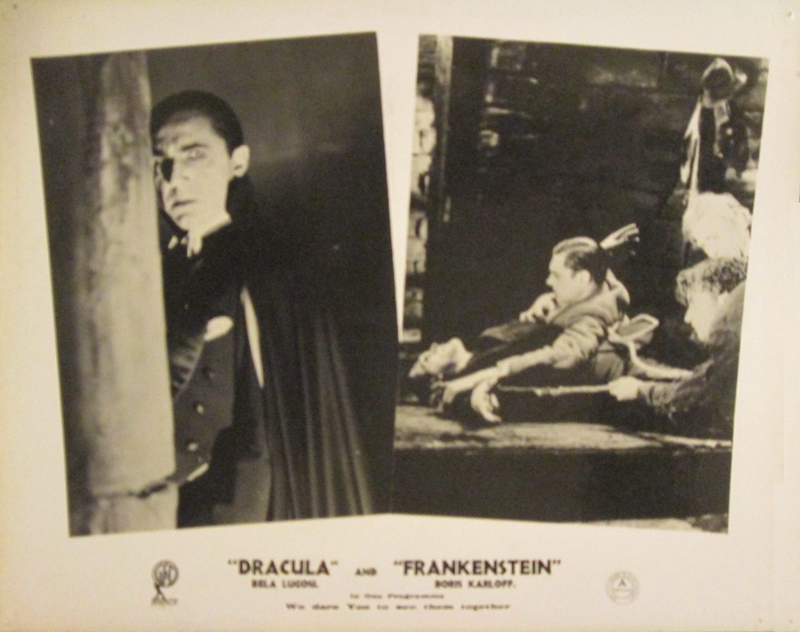 At the start of the year, he had been forced to apply to the Motion Picture Relief Fund for help with medical costs when his son, Bela George Lugosi, Jr., was born on January 5th, 1938. 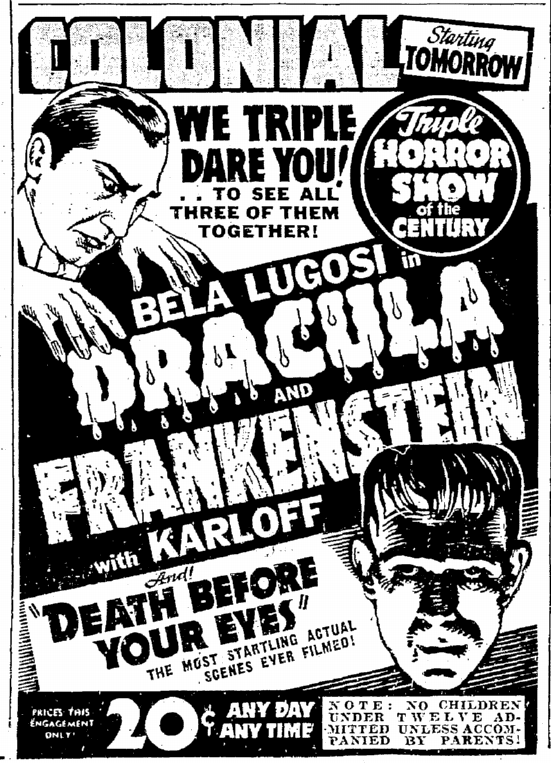 His only work during 1938 had been an appearance on the Baker’s Broadcast radio programme on March 13th, on which he sang a duet with Boris Karloff. 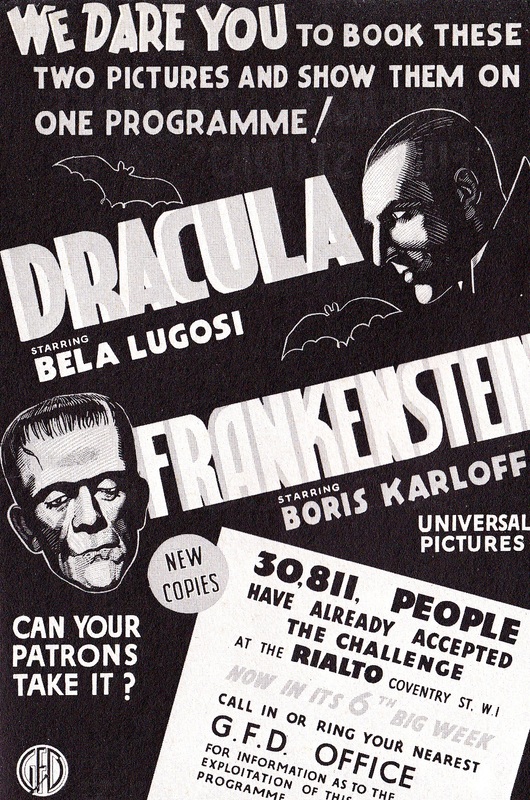 As the crowds began to grow outside the Regina-Wilshire, he was forced to move into a rented house when the mortgage company foreclosed on his beloved mansion at 2227 Outpost Drive. 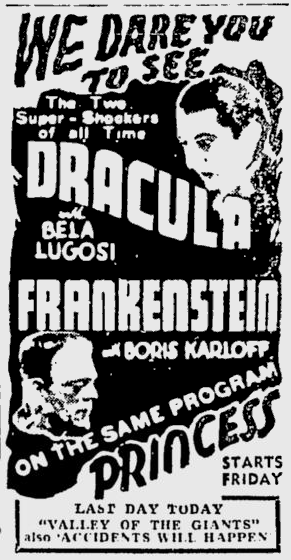 Realising the goldmine he had stumbled upon, Emil Umann, manager of the Regina-Wilshire, quickly hired the unemployed actor to make nightly public appearances at the cinema. 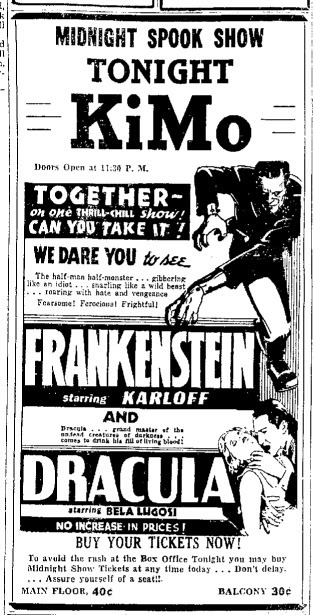 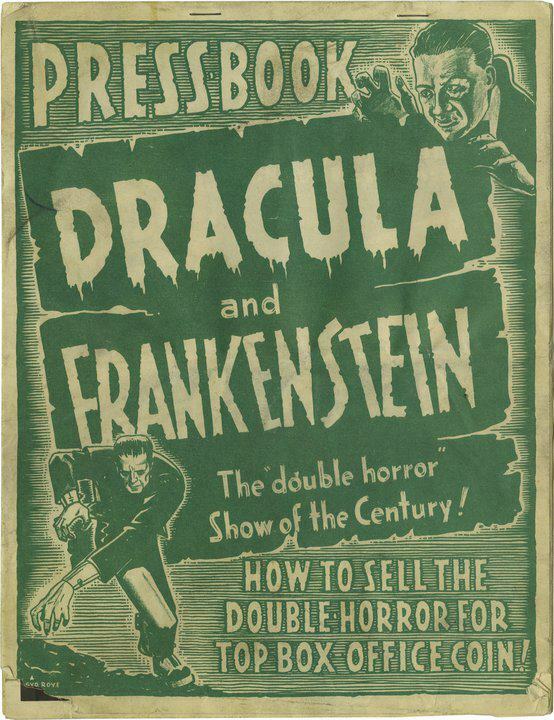 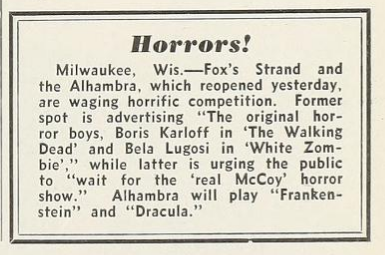 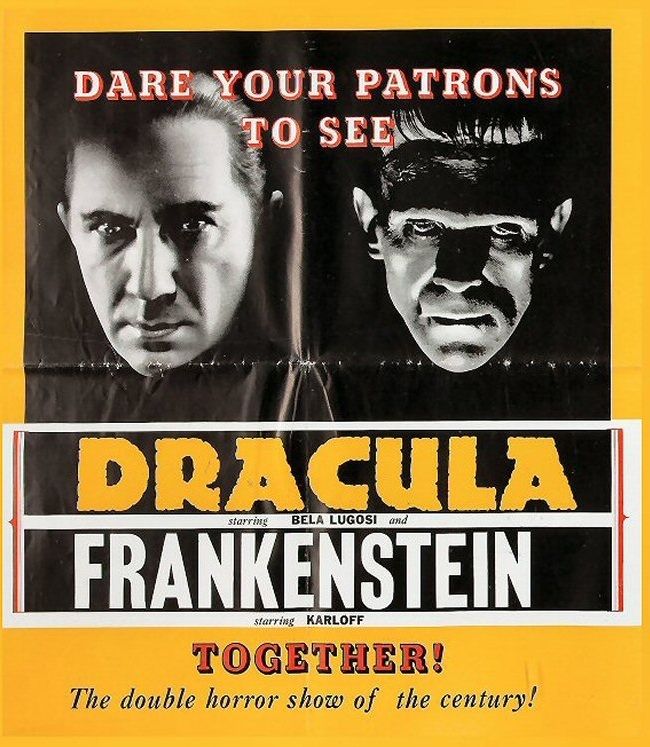 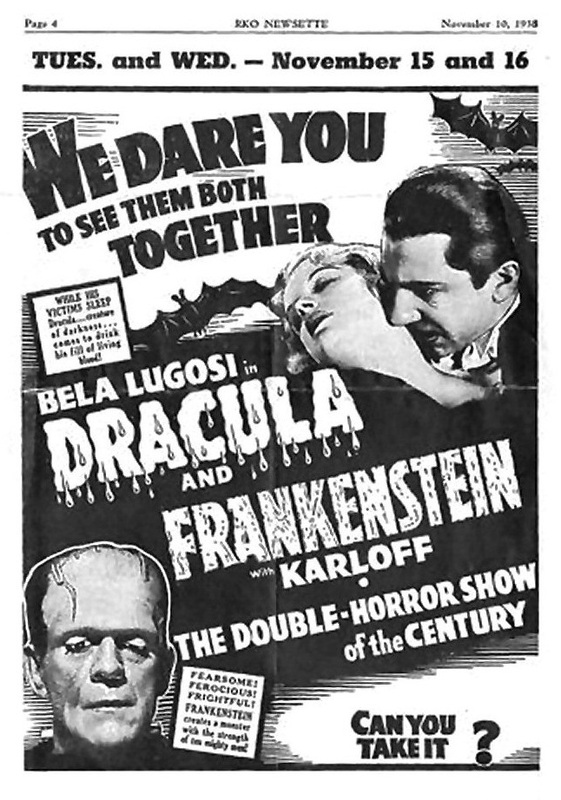 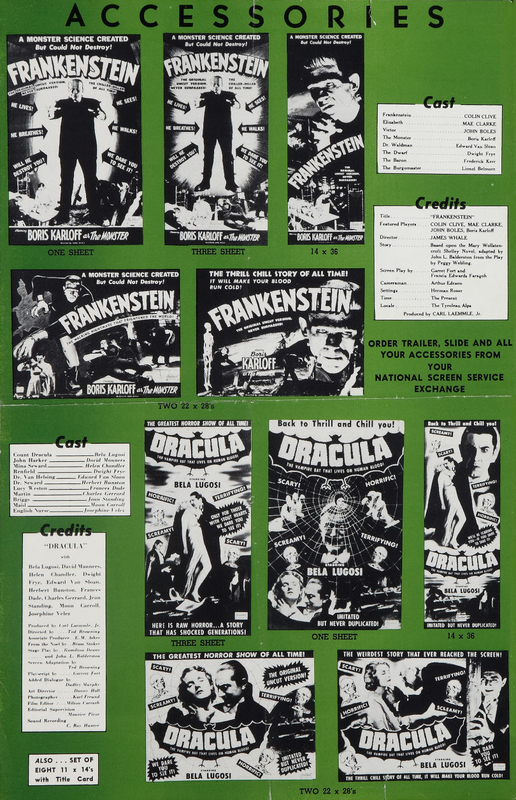 On a much smaller scale, the double-bill of Dracula and Frankenstein did excellent business again when re-released in 1951. 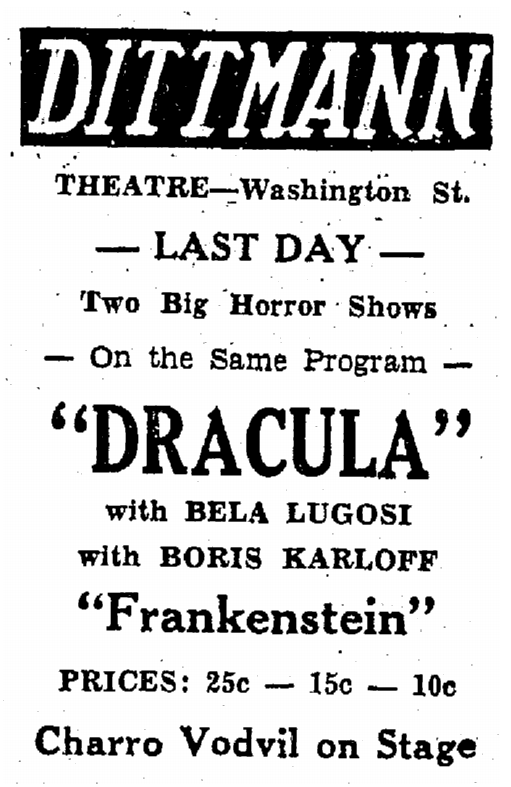 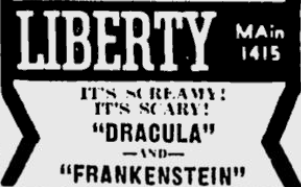 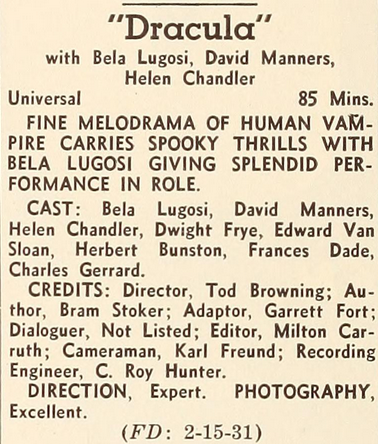 Unlike in 1938, however, it did not revive Bela Lugosi’s once again failing career. 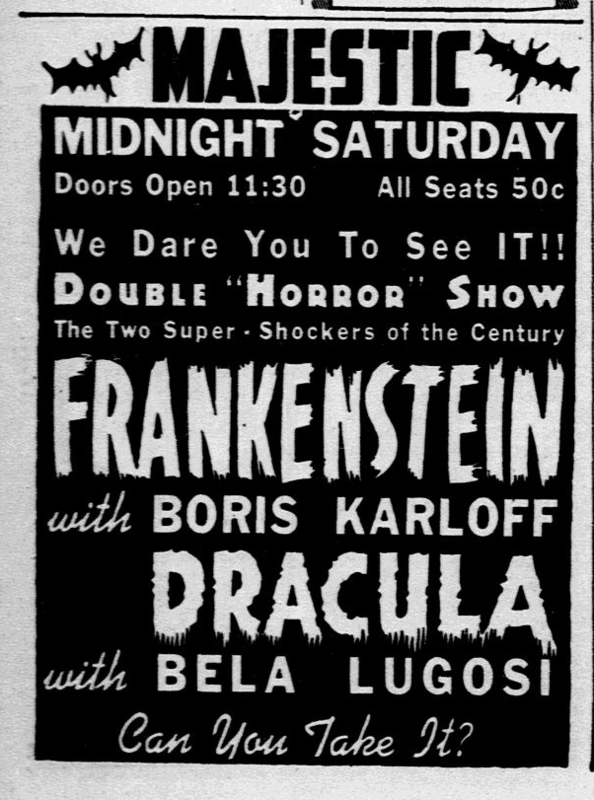 If you are within traveling distance it will be worth your while to journey to Regina one of theses nights. 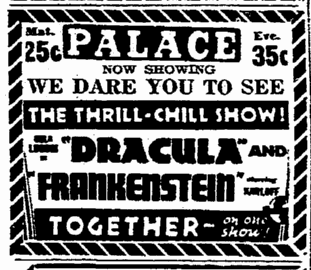 Because there is another treat in store for you. 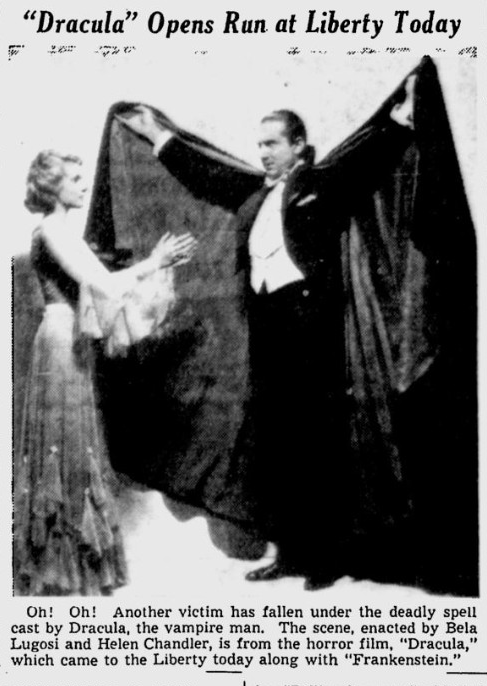 And that is the ovation that greets the appearance of Bela Lugosi in “Dracula.” Lugosi has been all but forgotten in Hollywood, though he has been with us all the time. 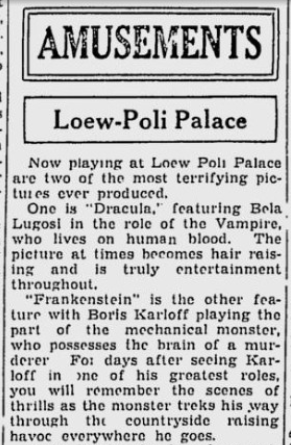 But the thumbs were down on horror pictures, and everybody proceeded to forget that Lugosi was a veteran actor, trained in the hard Continental school, long before Fate linked him with Dracula on the Broadway stage and later on the screen. 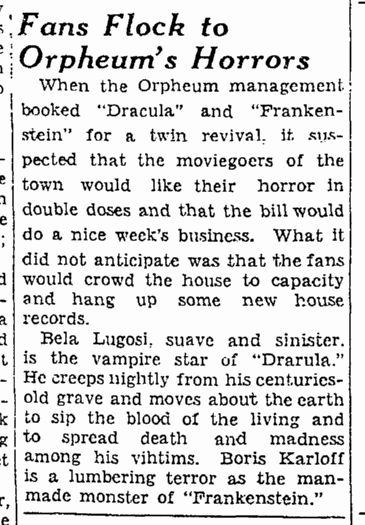 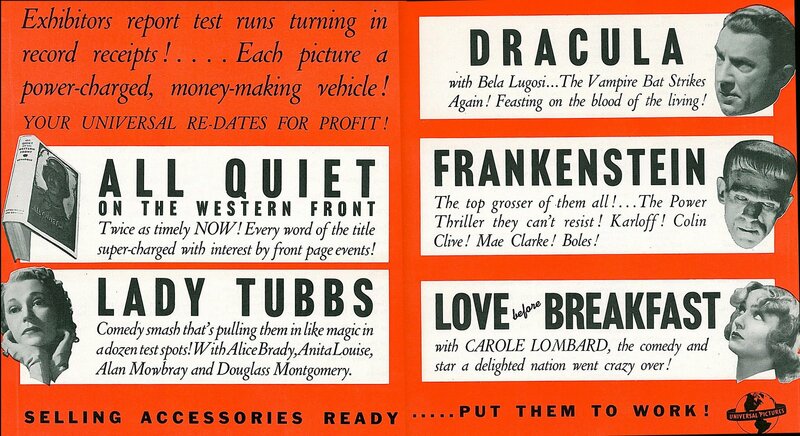 But the paying customers didn’t forget Lugosi. 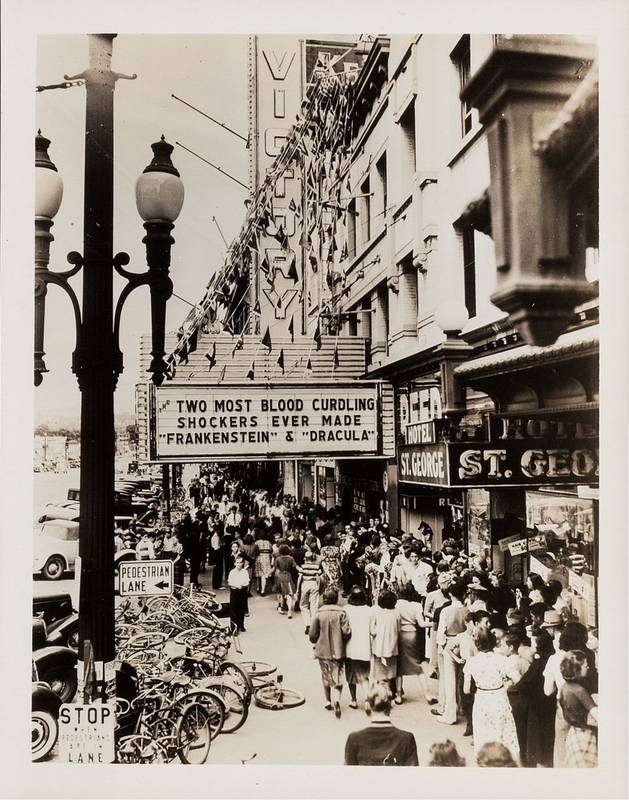 The proof is there in the Regina box office till, and can be heard from Regina audiences. 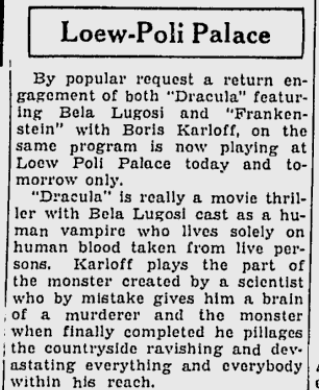 Perhaps it is about time for someone to “discover” Bela Lugosi. 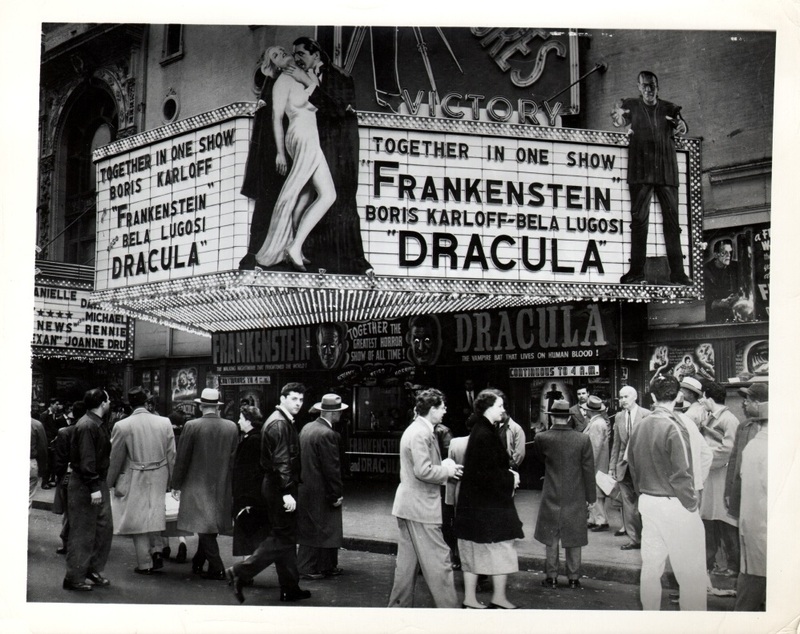 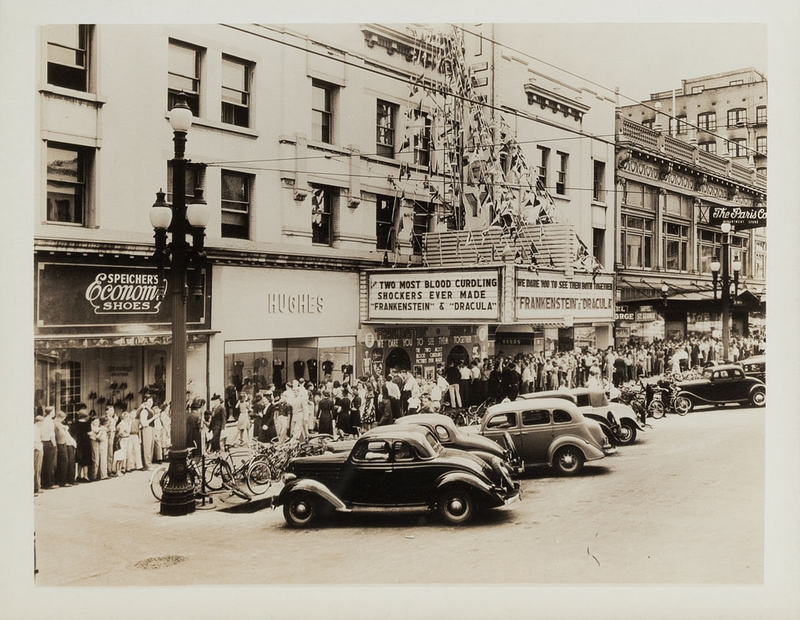 Five thousand people queued outside the Victory in Salt Lake City to see the double-bill. 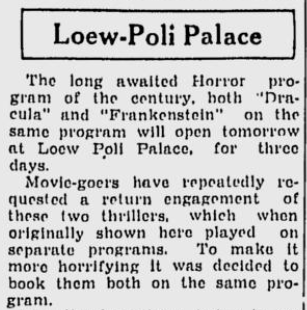 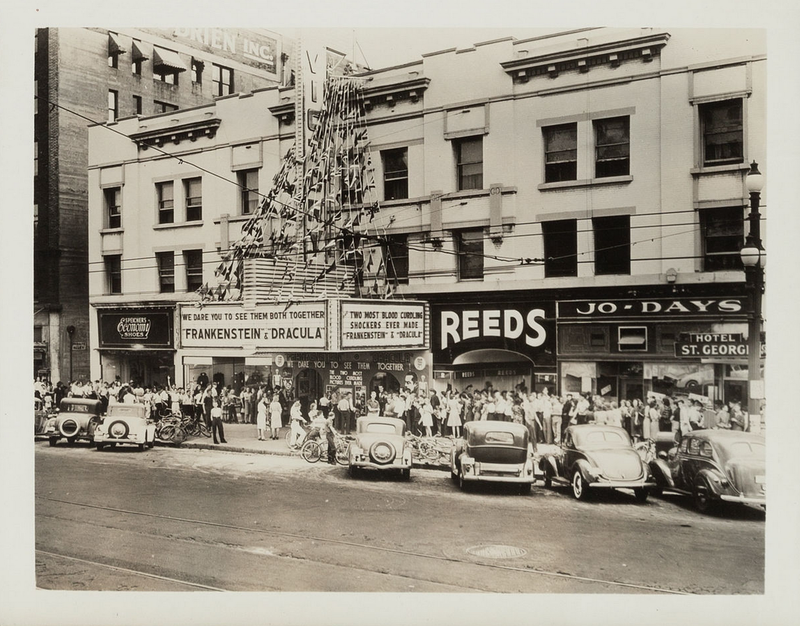 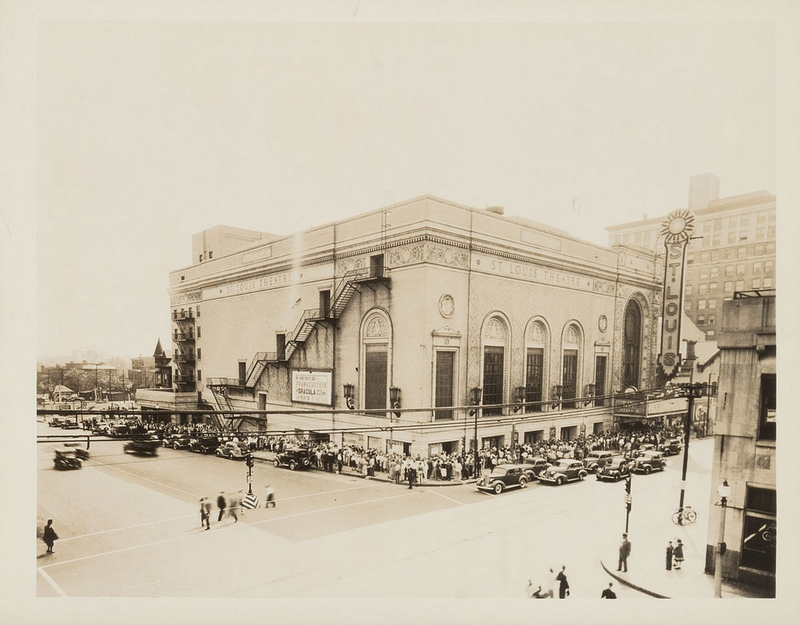 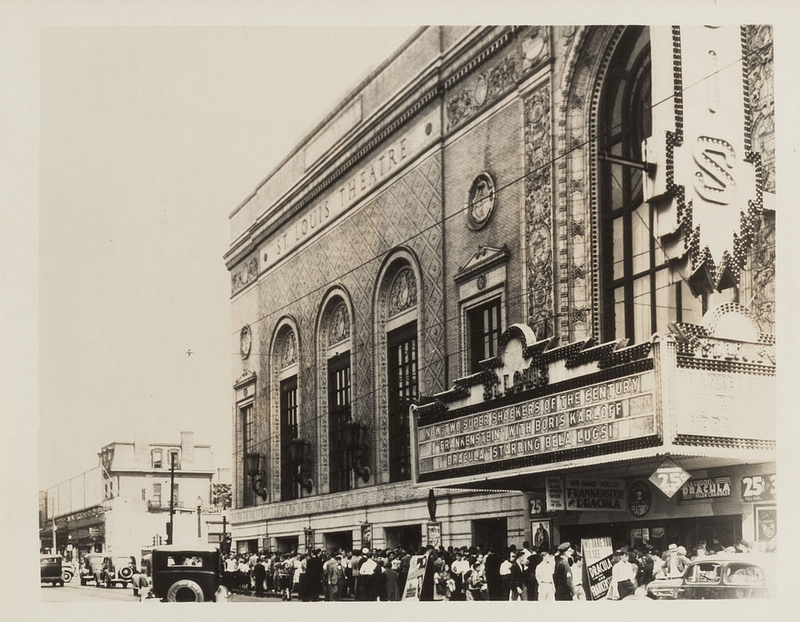 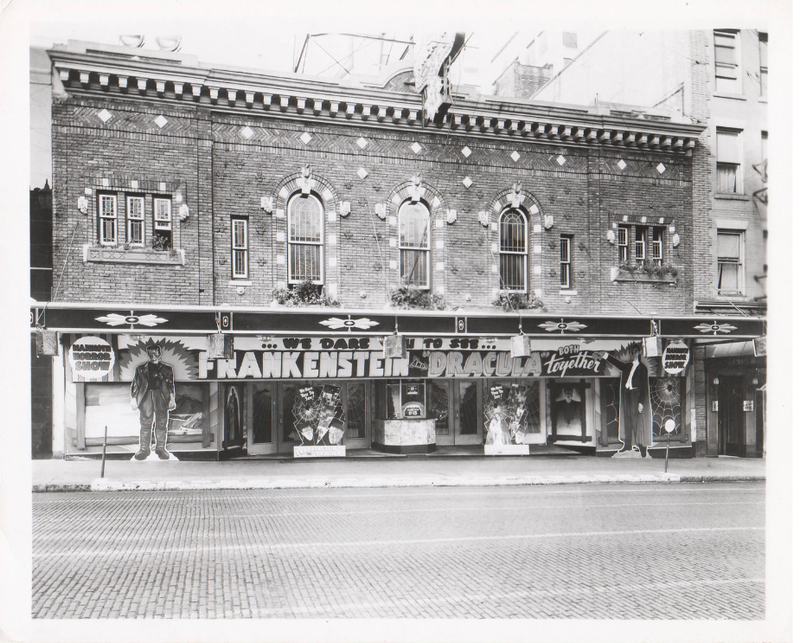 Unable to meet the demand, the manager rented the Broadway Theatre across the street and the films played simultaneously through the night. 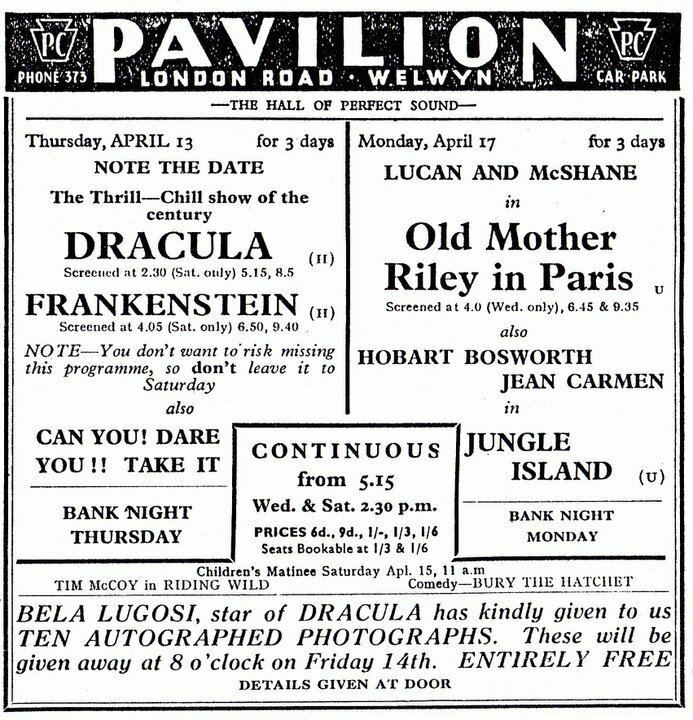 A full programme of horror is promised those who visit the revival of “Frankenstein” and “Dracula” at the Princess this week. 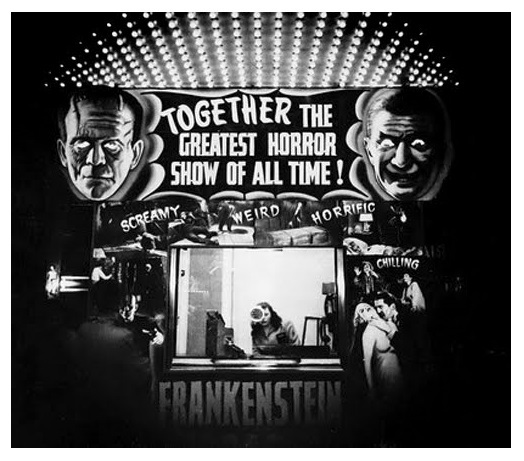 Each picture will be remembered as creating a favorably frightening impression in its day, and the combination should supply a sufficient number of thrills. 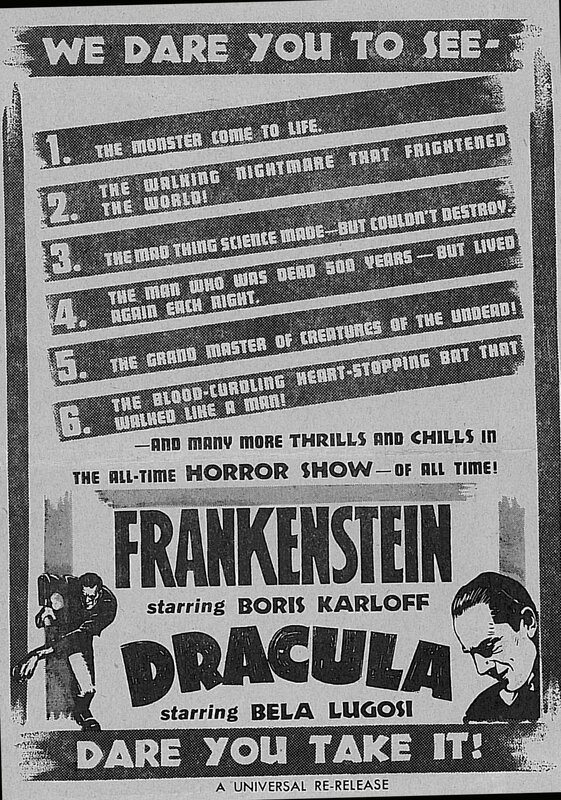 Of the two, “Frankenstein” remains the most effective. 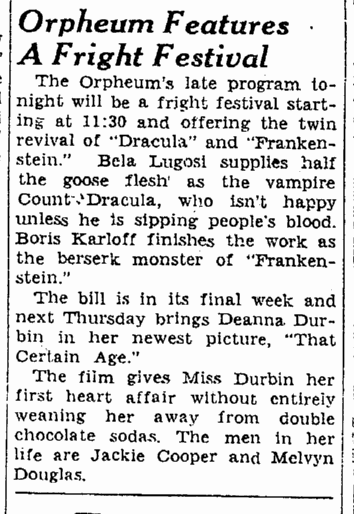 “Dracula” proves to be very funny in moments when it should hold us breathless. 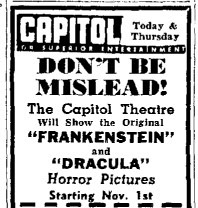 The difference seems to lie in the manner of acting. 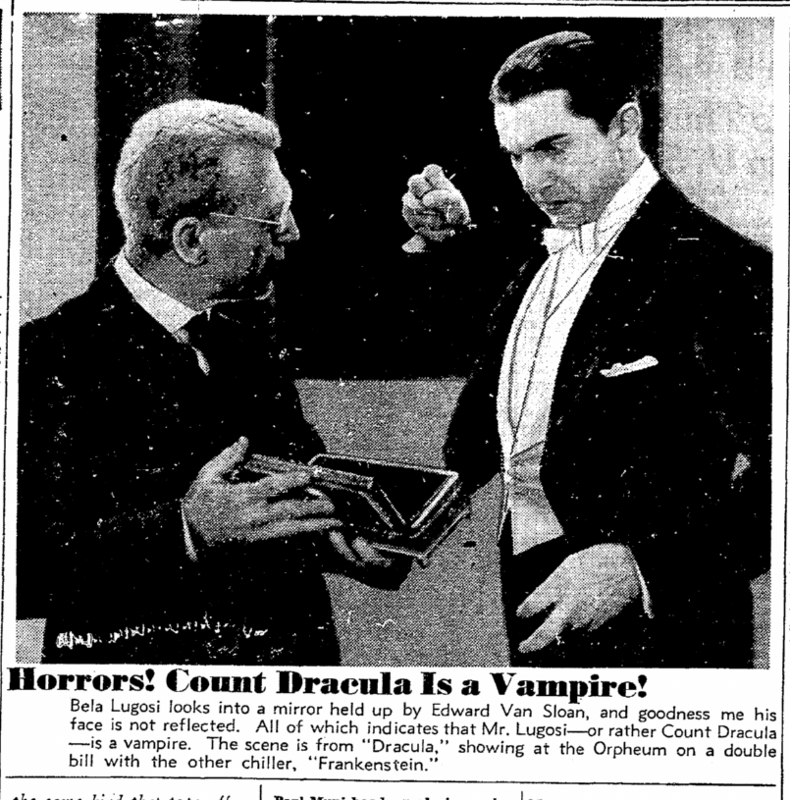 In “Dracula” it was considered enough that Bela Lugosi stand in well-cut dinner clothes (that is, well-cut for a man who must live in a coffin all the time that tailors’ establishments are open) and deliver piercing glances at the camera. 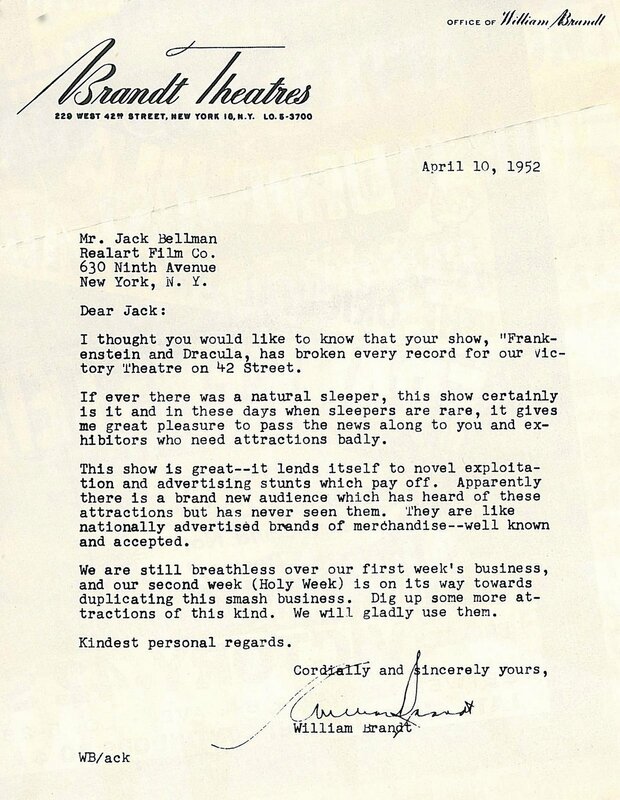 The rest of the acting seems to be as dated as the clothes ladies wear, more so in fact. 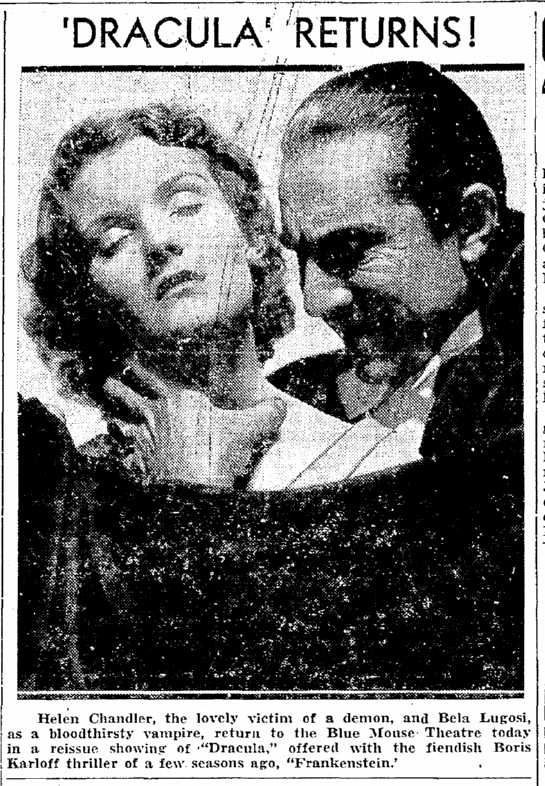 Helen Chandler makes a fluttering victim, with David Manners a stalwart hero. 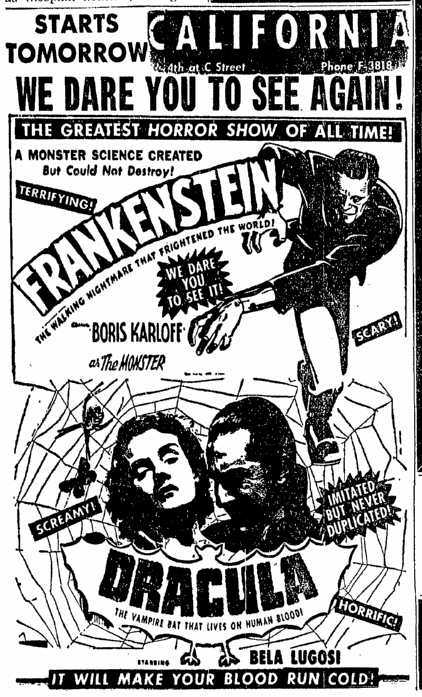 “Frankenstein” is quite another thing. 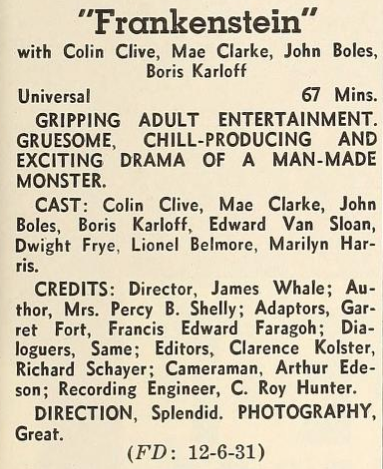 Here the characterizations given by Boris Karloff and the late Colin Clive, as the scientist and his monster, bring conviction to the strange tale of re-creation. 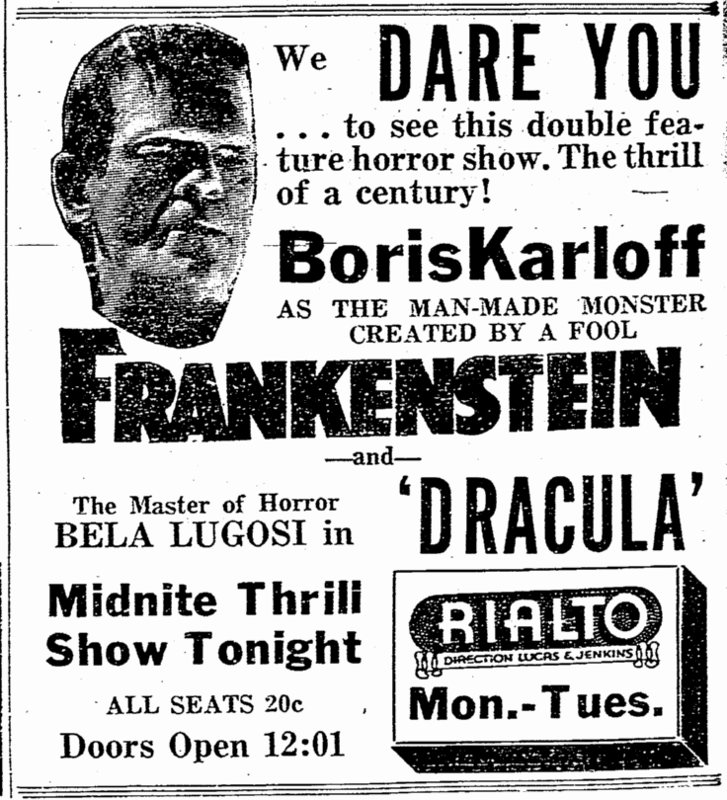 Karloff deserves the fame which the performance brought him. 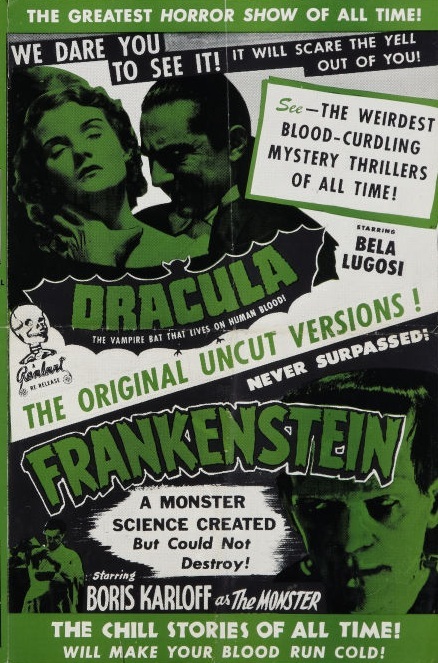 Here is no mass of make-up but a genuine attempt to project the reactions of a monstrous and unhuman creature. 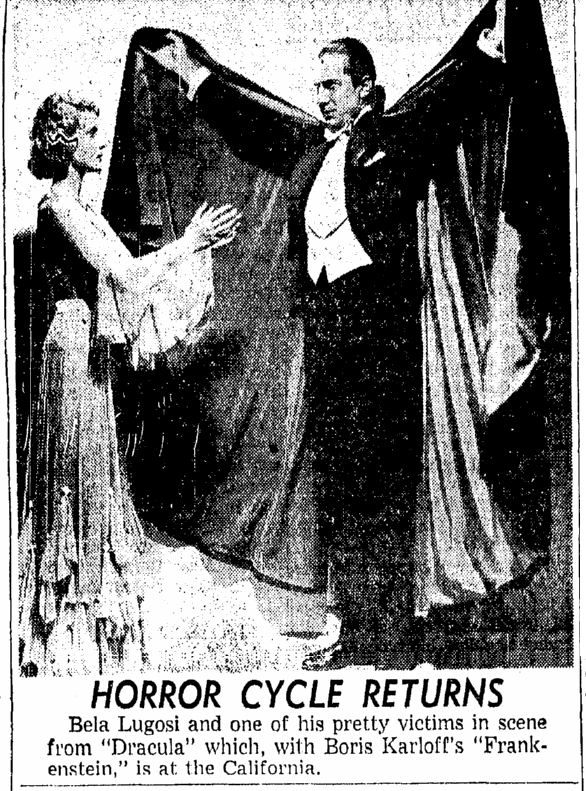 The moments when he sees the sunlight for the first time are still impressive ones. 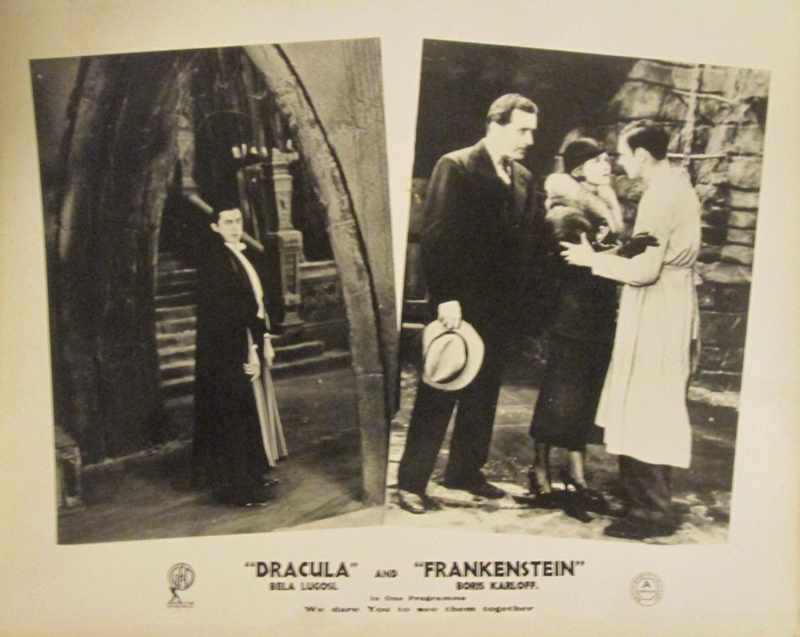 The general production bears up the good work of its leading players, resembling in some respects some of the old German films. 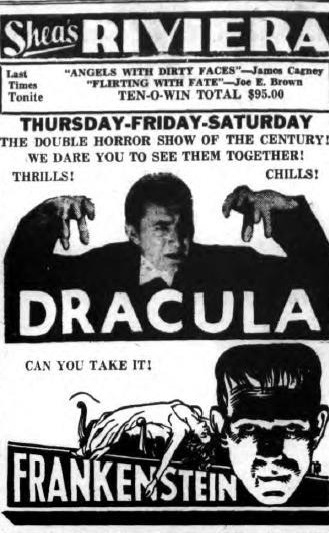 Its one annoying feature is the theatrical aspect of the mountain scenes. 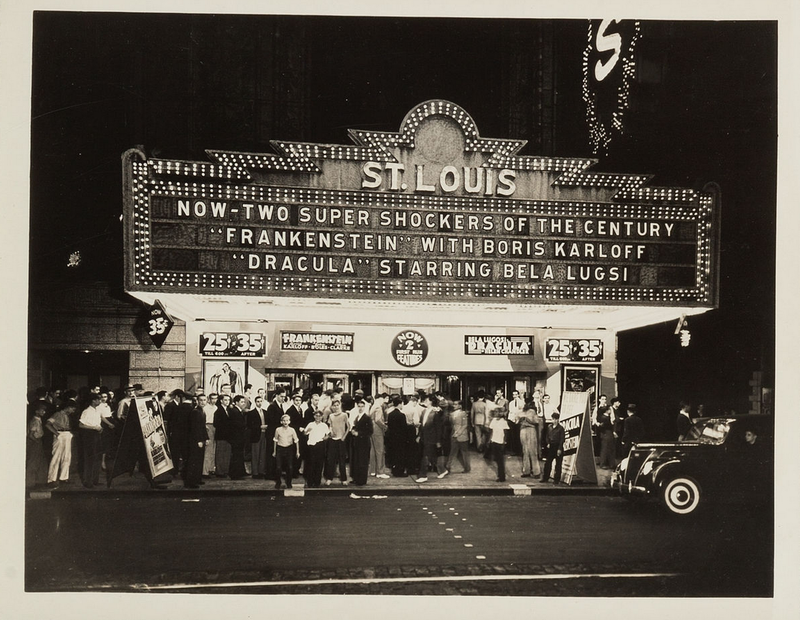 The whole evening should present as much of interest to those who have seen the films before as to those who come to see them for the first time. 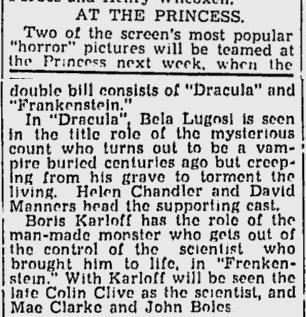 “Frankenstein should pave the way in public interest to the new film, “The Son of Frankenstein,” now in the making which will have both Boris Karloff and Bela Lugosi in its cast. 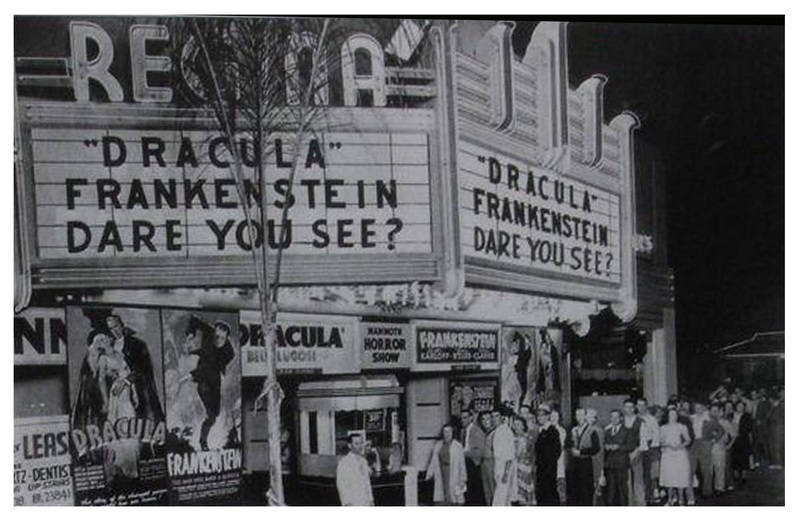 Shameful reminders of colour segregation. 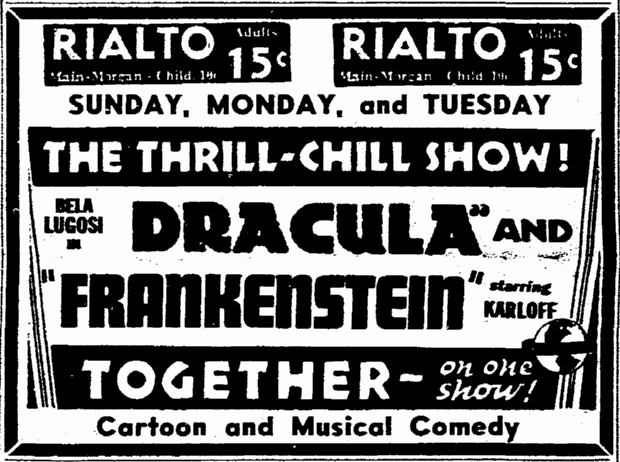 The films Frankenstein and Dracula will continue to be shownat the Rialto for another wee. 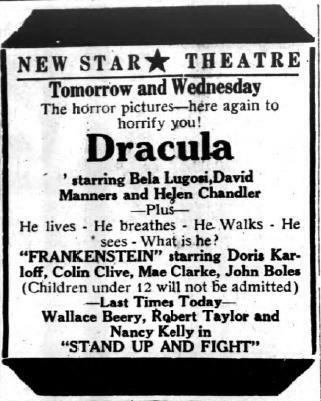 Notice Frankenstein stars “Doris” Karloff!